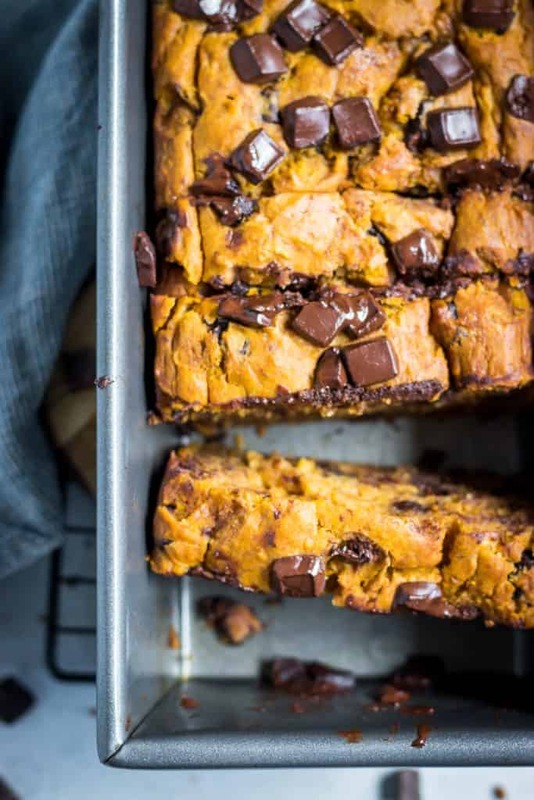 Pumpkin, banana and chocolate, oh my! This simple fall Pumpkin Chip Banana Bread recipe is a cozy treat that is perfect for any autumn occasion. Gotta love pumpkin season! I recently saw something that had the countdown of how many days until Christmas and I thought, WOAH! Just let me enjoy my pumpkin and crunchy leaves already, will ya?! It’s very evident that being in the present is very difficult in this day and age, and quite frankly I am sure it is a practice that has never been easy for any human throughout time. But in a world that tears down Christmas to throw up Valentine’s Day in a blink of an eye, we are just always planning for the next big thing that we have a hard time seeing what is happening right in front of our faces! I can most certainly promise you that I have never been one that is good at just being in the moment. I think I have mentioned before that even at just a few years old, if my parents gave me a cookie, the first thing I would ask is, “If I eat this cookie, will I get another?” I couldn’t just savor and enjoy the cookie I had–I had to know what would happen next, when the cookie was all gone. And this behavior pattern has shown up in many seasons of my life–wishing and hoping for a boyfriend, to get married, to have a baby–spending so much time aching for things to happen and wishing away the time I had in the here and now to get to those milestones. Well, if there has ever been a time in my life that I have wanted to be exactly here–right now, to savor, to experience, to feel it all–the time is NOW. People say it goes so fast, and I believed them, I did. But as I watch Sam today, I just don’t know where in the world the time has gone. Every time I look at him I think, Where is my baby?! A year next month, and while I am excited for the milestone, I will take the slow route to it. That’s right, let’s slow this train down a little bit and enjoy the scenic route. I know with fall comes the start of the holiday season and then in a blink of an eye, it’s New Year’s Eve. Well I will be doing everything I can not to wish it away–to savor, to experience and feel it all. I will try to step away from the technology and dive into the snuggles (that is, if I can catch Sam long enough to get a snuggle out of him), the cozy drinks, the warm soups–all of the things that are better when shared. I am not gonna let time pass me by, I am not gonna wish it away to get to the next big thing. I have everything I need right here with me so I am going to be fully in, fully present, and I am not gonna worry about whether I am gonna get another cookie after I finish, nope, I am gonna eat the cookie, and enjoy every last bite! !–Or in tonight’s case, the Pumpkin Chip Banana Bread! I know, I know, what took me so long to bring this fall goodness to your attention?! Aaaand, I know what you are thinking: wait, if I finish one piece of bread, will I get another? Sorry, that’s all up to you, you are on your own. But I do recommend sharing a warm piece with someone you love. That makes everything taste even better, right? Up until a few months ago, I lived my life of banana bread in the straight and narrow. I made the basic version, ya know, bananas, some cinnamon and maybe some nuts, but never really went outside of the box much. That all changed when I made this White Chocolate Almond Banana Bread. It was perfection–so different but so simple and delicious. As with most recipes, if I make one version I love, I will then make about 10 other varieties since I can’t get enough. Don’t believe me? 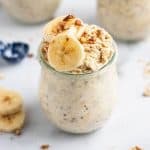 Check out all my Overnight Oats recipes! Since fall is here–and the weather is finally feeling like it’s catching up to the season as well, even more pumpkin recipes are required. Why not start with a pumpkin banana bread then?! A few things to note about this recipe, although it’s pretty simple and straightforward. First, I used chocolate chunks but chips will work just fine. My grocery has these amazing dark chocolate chunks and I love them, but so not necessary if you can’t find any. Second, I go back and forth on cinnamon in this recipe. I have made it with and without–I think I like it better without but then there is some part of me that feels like cinnamon has to be in the recipe due to the pumpkin. There’s something about the chocolate and cinnamon that I am not sure quite goes together, so I added it in the end as an optional ingredient, just depends on your flavor preferences. I will probably skip it most of the time, but can still appreciate anyone who wants it! Other than that, you should have most of the ingredients in the house which is always a big win when it comes to any recipe. So what are you waiting for?! Let’s do this! In a medium bowl, mash bananas well. Add in egg and whisk together. Mix in butter, vanilla, pumpkin and brown sugar until smooth. In a separate bowl, whisk together flour, salt, baking soda and baking powder. Pour the dry ingredients into the wet and stir. Fold in 2/3 c chocolate chips. Pour batter into a well greased bread pan and top with chocolate chips. Bake for 45-55 minutes or until a toothpick comes out clean. Allow to cool before serving. 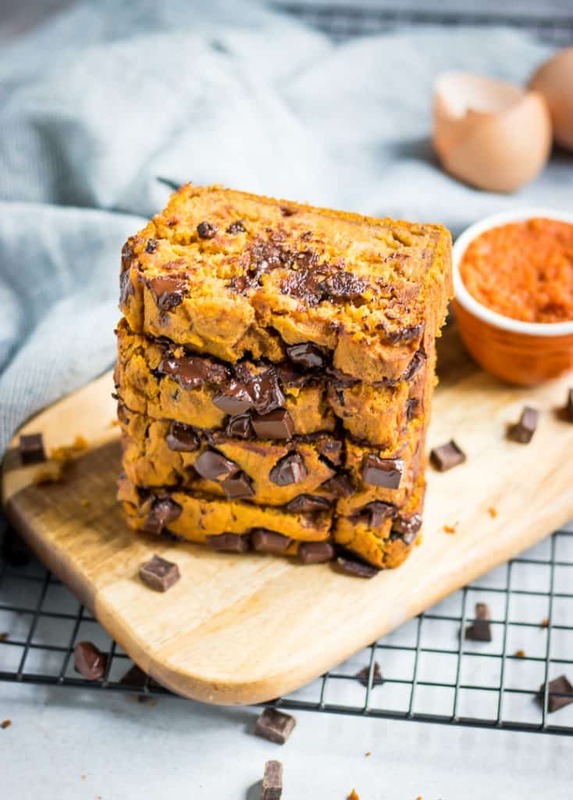 Well the pumpkin fanatic in me loves this recipe. I always have bananas in the freezer. I know my grandkids would love to have a slice of this after-school. Maybe gramma needs to bake them a treat. I really enjoyed reading this post! Your discussion of how we so often miss out on the here-and-now is absolutely on-point (I’m looking at you, Halloween candy on sale in August), and your story of those childhood cookies is adorable! But that does leave a dilemma here, doesn’t it … will there be a second piece of this amazing bread, after the first (and should I follow your suggestion to share a warm piece with a loved one, or hoard it ALLLLL for myself?!?)? Decisions, decisions. At any rate – a terrific read, wonderful recipe and gorgeous pics (as always)! Love it! Oh Shelley I totally understand the dilemma. Thanks for making me smile today!!! Pumpkin and chocolate go SO well together!! 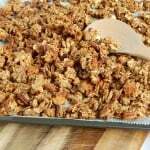 I love that this is beyond your regular banana bread and has that fall touch to it!! I was surprised by how much I loved the combo! 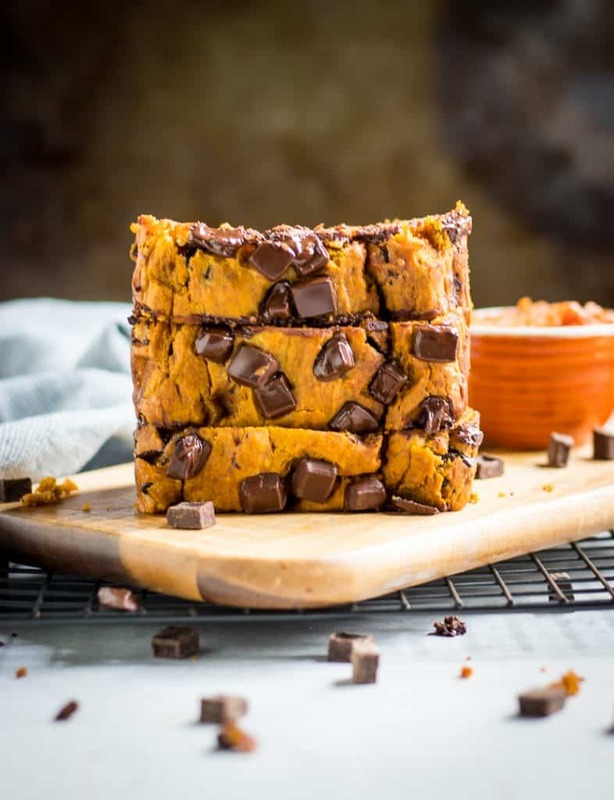 This pumpkin chocolate chip banana bread looks SO good! Like, I didn’t even make it past your first photo before I found myself pinning it for later. I’m definitely going to have to give it a try in the not-too-distant future. Ha, thanks so much Claire!!! Those giant melty chocolate chunks are making me drool! I am going to have to make a batch of this ASAP ! I’ve been making banana bread for the parents – but good as it is, it’s starting to be a little boring… This looks like a perfect way to shake it up (and add some vegetable… heh, heh…) And I know they’ll love the chocolate chips! Aren’t you the sweetest daughter!! Those chocolate chunks looks sooooo much better than chocolate chips — so big and melty!! This looks amazing. I love this recipe. 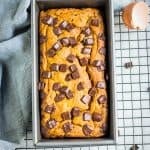 Pumpkin Chip Banana Bread sounds absolutely delicious. The combination of flavours is awesome and perfect for Halloween! !